Egyptians continue to express a strong desire for democracy and for specific democratic rights and institutions. They also tend to believe that having a democratic government should be a priority, even if that leads to some risk of instability; however, the percentage who prioritize stability has grown since last year. While they endorse democratic principles, most Egyptians say they are dissatisfied with the way their new democracy is currently working, and this view is especially widespread among supporters of the opposition. Moreover, while Egyptians continue to want democratic freedoms, they also express a strong desire for economic growth and law and order. 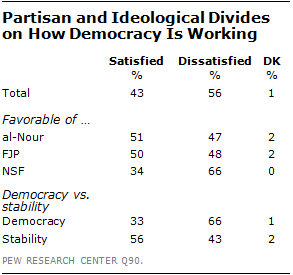 Two-in-three Egyptians believe democracy is the best form of government, while just 21% think that in some circumstances a non-democratic form of government can be preferable. An additional 11% say that, for someone like them, it does not matter what kind of government Egypt has. 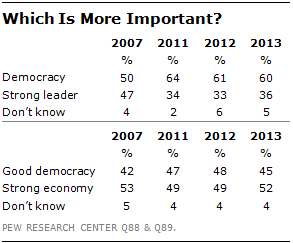 These results are very similar to last year, when 67% described democracy as the best form of government. A notable gender gap exists on this question: 73% of men say democracy is preferable to other types of government, while just 59% of women hold this view. A solid majority of Egyptians (60%) say the country’s problems can best be solved by democracy, while 36% believe a strong leader would be best equipped for dealing with these problems. There has been little change on this question since last year, although confidence in democracy is higher today than it was in 2007, when the public was almost evenly divided between those who expressed confidence in a democratic system and those who had more confidence in a strong leader. When asked whether having a good democracy or a strong economy is more important, Egyptians are more divided, although they lean toward the latter: 52% say a strong economy should be the priority, while 45% choose democracy. 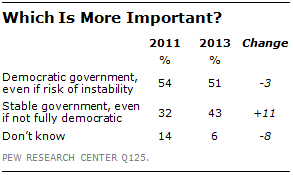 By a slender margin, Egyptians tend to prioritize democracy over stability. About half (51%) say it is more important for Egypt to have a democratic government, even if there is some risk of political instability. Slightly fewer (43%) believe it is more important to have a stable government, even if there is some risk it will not be fully democratic. However, the percentage who prioritize stability has increased since 2011, when just 32% held this view. Men place more importance on democracy than do women. Egyptians with a favorable opinion of the NSF are especially likely to say having a democratic government is more important than having a stable government. And those who do not believe laws should strictly follow the Quran are also more likely to prioritize democracy. Majorities rate all of the specific democratic rights and institution on the survey as at least somewhat important, and most say a fair judiciary, free media, and honest, competitive elections are very important. Views about these features of democracy have mostly held steady since last year, although support for free speech has slipped – in 2012, 60% said it is very important to live in a country in which anyone can criticize the government, but now 51% express this opinion. The percentage who believe it is very important that Coptic Christians and other religious minorities can practice their religion freely also declined slightly, from 38% to 32%. Among the attributes of democracy on the survey, having a civilian-controlled military is considered a relatively low priority, although most still say it is at least somewhat important and 27% rate it as very important. In addition to democratic freedoms, it is clear that Egyptians also consider economic prosperity and law and order top priorities. Fully 83% rate improving economic conditions as very important, and 62% say this about law and order. While most Egyptians believe it is important that women have equal rights, they are divided over the current government’s approach to this issue. Four-in-ten say the government is doing the right amount to ensure that women have the same rights as men, 33% think it is doing too little, and 15% believe it is doing too much. There are no significant differences between the views of men and women on this issue, but there are notable divides along partisan and ideological lines. Egyptians with a favorable view of the NSF and those who do not think laws should strictly follow the Quran are particularly likely to say the government is not doing enough to ensure gender equality. A 56% majority of Egyptians say they are dissatisfied with the way democracy is working in their country; just 43% are satisfied. Interestingly, people who prioritize democracy over stability are especially likely to be unhappy with how the new democratic system is working (66% dissatisfied). Roughly two-thirds of those with a favorable opinion of the NSF (66%) are dissatisfied, compared with just 48% of FJP supporters and 47% of those with a positive view of al-Nour. By a narrow 51%-44% margin, Egyptians say the current government respects the personal freedoms of its people, although on this question there are again significant partisan and ideological gaps. 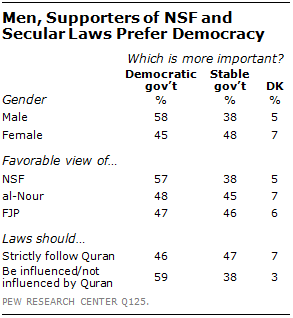 People with a positive view of the NSF, those who do not think laws should strictly follow the Quran, and those who prioritize democracy over stability are more likely to believe the current government is not respecting Egyptians’ individual freedoms. Even though Egyptians are not happy with the way their new democracy is working, they have not lost faith in the value of political participation. 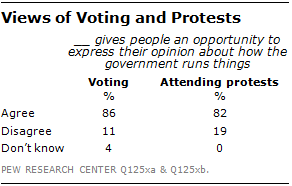 Huge majorities say that voting (86%) and attending protests (82%) give them an opportunity to express their opinion about how the government runs things.